From the launch of Summer Jazz Camp nearly twenty years ago, education has been the heart and soul of San Jose Jazz. Our highly-regarded programs include Progressions, a research-based youth development program that uses music to connect with low-income, at-risk students. High School All Stars is a regional, audition-based big band for talented young players. The large ensemble and small combo play high-profile gigs all over the region, including this year’s Summer and Winter Fests. 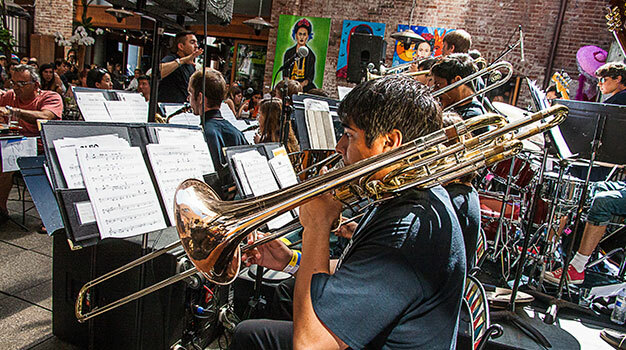 Summer Jazz Camp connects talented middle and high school students with the Bay Area’s best music teachers for a life changing, two-week learning lab. The Next Gen Stage at Summer Fest provides students with opportunities to perform alongside internationally acclaimed artists. Progressions is generously supported by B.E.S.T. – Mayor’s Gang Prevention Task Force, Leo M. Shortino Family Foundation, Sharks Foundation, City of San Jose Safe Summer Initiative Grants (SSIG), Comerica Bank and individual donors.